The New department has eight visible icons (Vicinity to Shazam) representing apps that are (what else?) new. The App Store screen shows the different departments when you browse. The What’s Hot department features eight icons (SmugShot to PayPal) representing apps that are popular with other iPhone users. The Staff Favorites department shows icons of apps that are highly recommended by the iTunes Store staff. There are also display ads for six featured apps between the New and What’s Hot departments (Texas Hold’em to Jott for iPhone). Two other departments appear to the right of the main ones: Top Paid Apps and Top Free Apps. The number-one app displays both its icon and its name; the next nine apps show text links only. Finally, to the left of the main departments is a special navigation department known as Categories, with text links to describe each one. Click these links to see the available apps that fit each category description. Browsing the App Store screen is great, but if you know exactly what you’re looking for, there’s a faster way to find it. Just type a word or phrase into the Search iTunes Store field in the upper-right corner of the main iTunes window, and then press Enter or Return to initiate the search. If you want to be able to use your iPhone as a flashlight, search for the word flashlight. 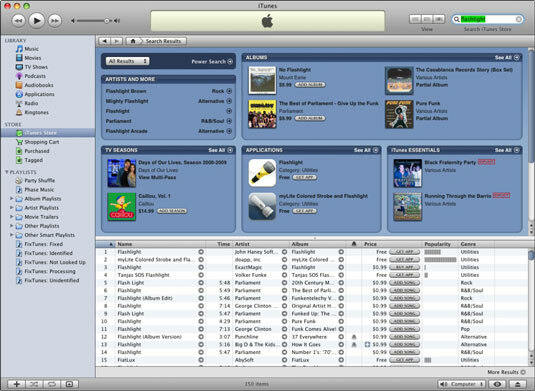 The only drawback is that you have to search the entire iTunes Store, which includes music, television shows, movies, and other stuff in addition to iPhone apps. Fortunately, your search results are segregated into categories. If you click the See All link at the right end of the category’s title bar, all iPhone apps that match your search word or phrase appear.